I’m back at my desk and my mind is full of festive images…Christmas sing-a-longs, snow-covered hill-tops, purple clouds over a golden sunset, hoicking our friend out of a muddy puddle on a country walk (we nearly had to sacrifice his wellies!). Good times. Waiting for me on my return was a very exciting parcel; an advance copy of a picture book I worked on last year for Little Door Books. It’s called How Billy Hippo Learned to Swim and is about a little hippo who hates water. It’s a lovely story written by the super-amazing Vivian French. Little Door Books were fantastic to work for; hugely supportive, thoughtful, and massively committed to producing beautiful children’s books. I learnt loads and am thrilled to bits with the final copy. Billy Hippo is out in March so I’ll keep you posted! 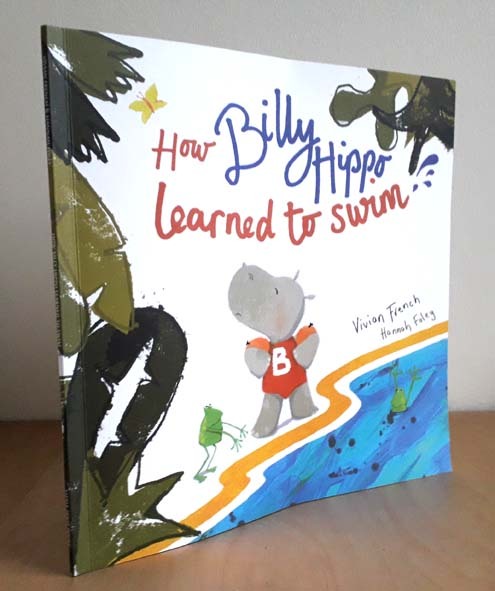 This entry was posted in Family and friends, Illustration and tagged author, Billy Hippo Learns to Swim, children, christmas, country walks, frogs, Hannah Foley, hills, hippos, illustrator, Little Door Books, mud, picture books, publisher, snow, sunsets, swimming, vivian french, wellies. Bookmark the permalink. Congratulations & isn’t it super when you learn things through pressing on with what you want to do.